Thanks for your patience while I get this all back online. ~Hannah Belle, $325 RETAINED for our herd bLue EyEs! ~ High Noon Hank,$75 SOLD THANKS Shirley & Barnett, KS bLuE EyEs! Quad DOES! : Lilah Blue,$ 325 RETAINED for our herd bLuE eYeS! Lucy Jo , $325 SOLD Thanks Terry in MO! bLuE eYeS! Lacy Rose,$325 SOLD Thanks Jeff in MO! LILAH BLUE: Having Pecan Hollow Gypsy Rose as a mother is a wonderful advantage in life to start with: Able to carry full-term quad does (who were NOT small) , and with a very capable udder and large hand-milkable teats, Gypsy's parents also both have milk stars (Pecan Hollow DAJ Calico Rose *D x Twin Creeks BW SanFranciscoBay*S). Jack Sparrow's milk background from his dam ARMCH Twin Creeks MB Stellaluna *D E *AR2097 who had a glorious udder, and genetics from Munchranch Cactus Jack give these four doelings a very good foundation to grow and flourish as milkers or for show. 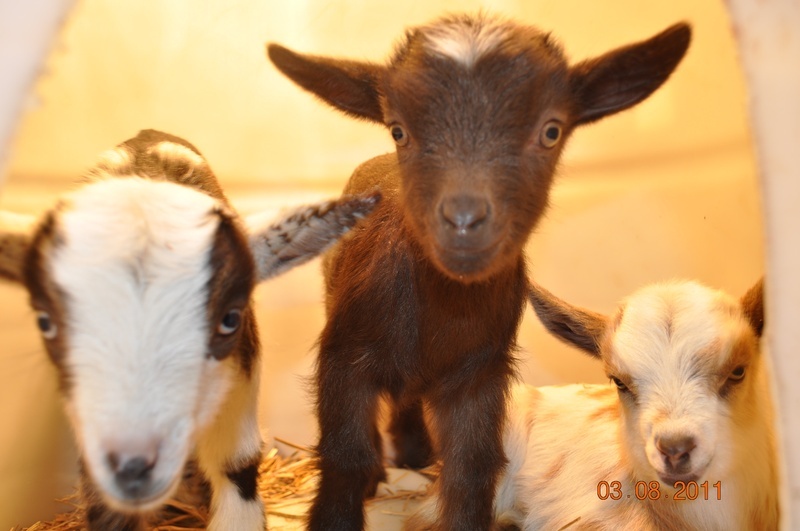 LACY ROSE: Chocolate one in Middle (Mama' s little clone!) See ABOVE description of breeding. LULA ZUL: See Breeding description above. 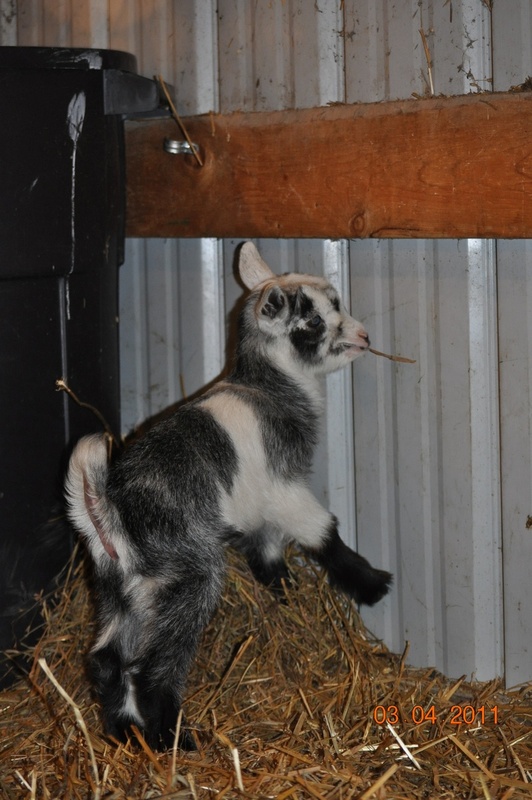 ~BUCKLING: Lumberjack, $250 RETAINED FOR OUR HERD bLuE eYeS! 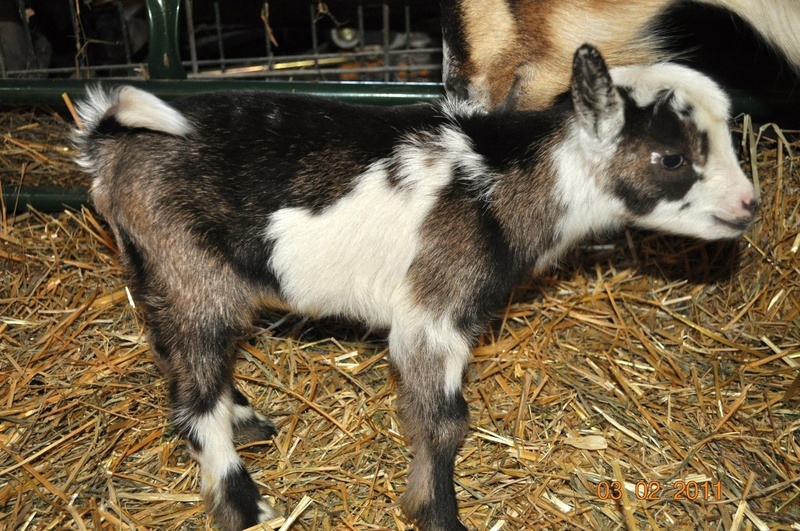 ~DOELING: Fortunes Fancy, $325 SOLD Thanks Shellie in MO! bLuE eYeS! LUMBERJACK: What to say about Lumberjack other than the obvious coloring? Well, his Mama, Vista, is out of Hill Country's Virtual Reality 7*D (4xRGCH) and MCH Lost Valley Malachi *S, so maternal milk lines are VERY strong, and then you have Dragonfly Jack Sparrow's contributions, which include ARMCH Twin Creeks MB Stellaluna *D E *AR2097 who had a glorious udder, and Munchranch Cactus Jack! 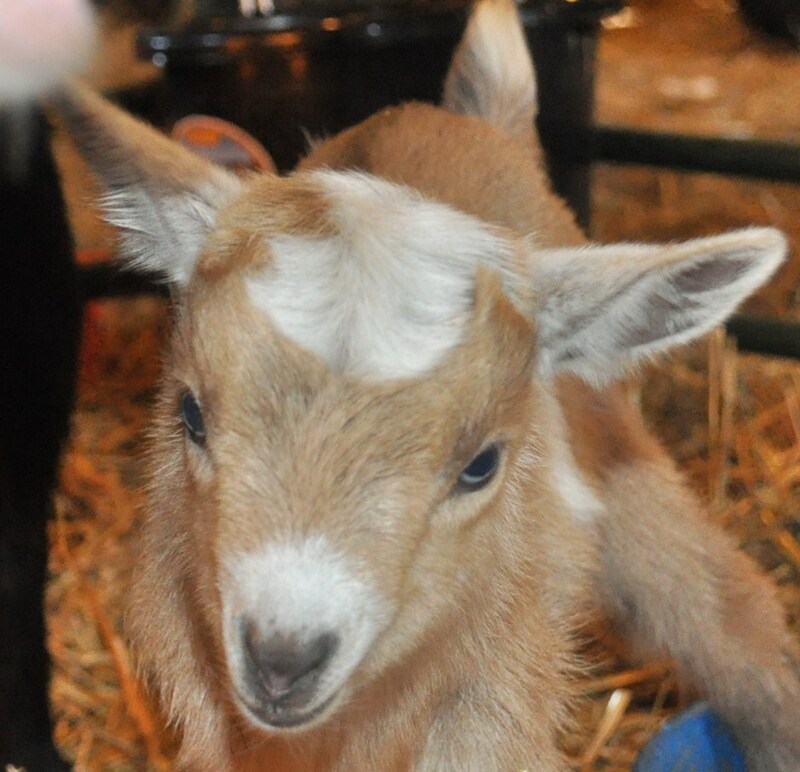 Hoping for a "very-dairy"-maker in this little guy! and a few spots wouldn't hurt a thing either! ~ Cantina Rose, $325 bLuE eYeS! 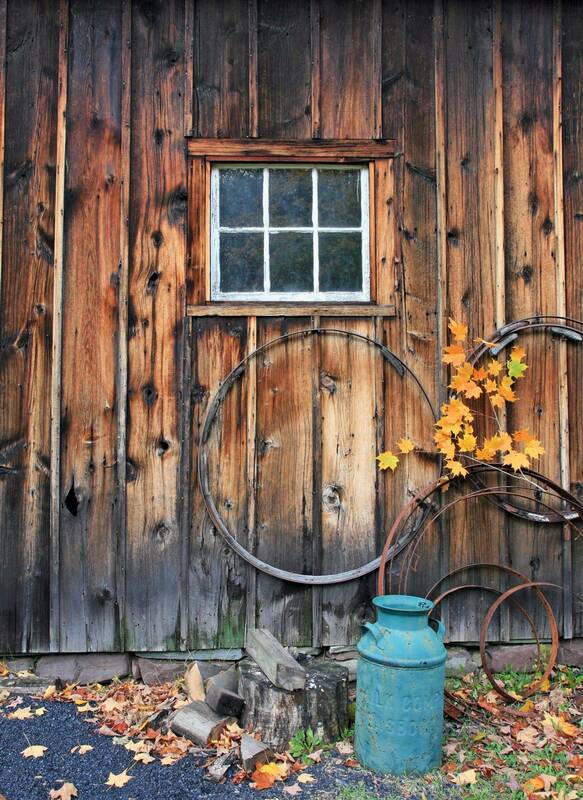 SOLD Thanks Julie in MO! CANTINA ROSE: Though a first freshener, we expect great things from these twins' dam, Leather. Her dam is MCH Pecan Hollow GL 2*D, and we expect her milk capacity to grow with each future freshening. Rose and her sister (below) Feleena) should bring in Leather's heritage with that of Jack Sparrow's ARMCH Twin Creeks MB Stellaluna *D E *AR2097 to make some terrific milking capacity and very dairy structure! WICKED FELEENA: See Above description of lineage and credentials. ~Buckling: Cotton Eyed Joe, $200 SOLD Thanks Ralph in KS! bLuE eYeS! 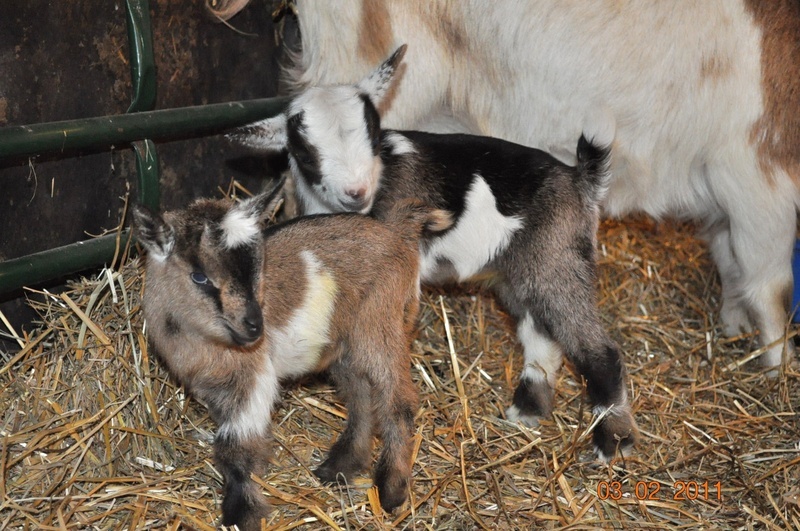 ~Doeling: Two Step Tillie, $325 SOLD Thanks Terry in MO! Cotton Eyed Joe is a Big hulking, laid-back boy who has the looks of an angel, but with the lineage to back it up! 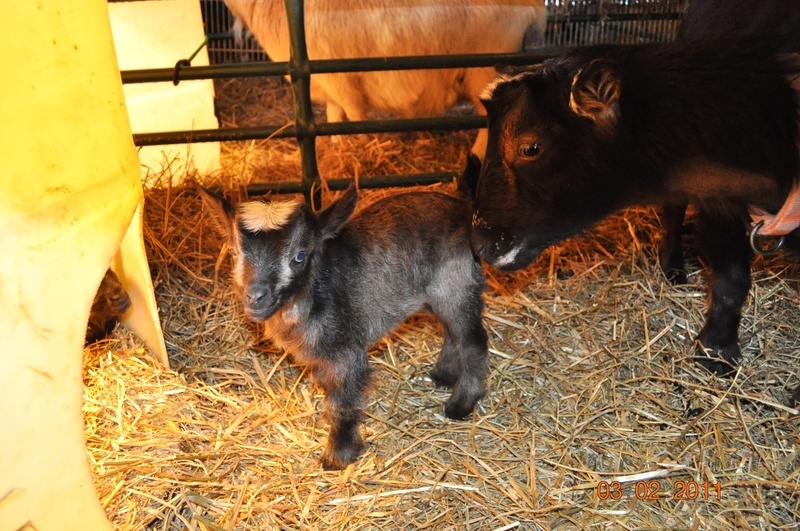 He is out of Jack Sparrow and Kizzi's Kuties Kitana, who as mentioned above has a beautiful udder and nice hand milkable teats, but also a was sired by "Caesar's Villa Flirt n' with Fire." 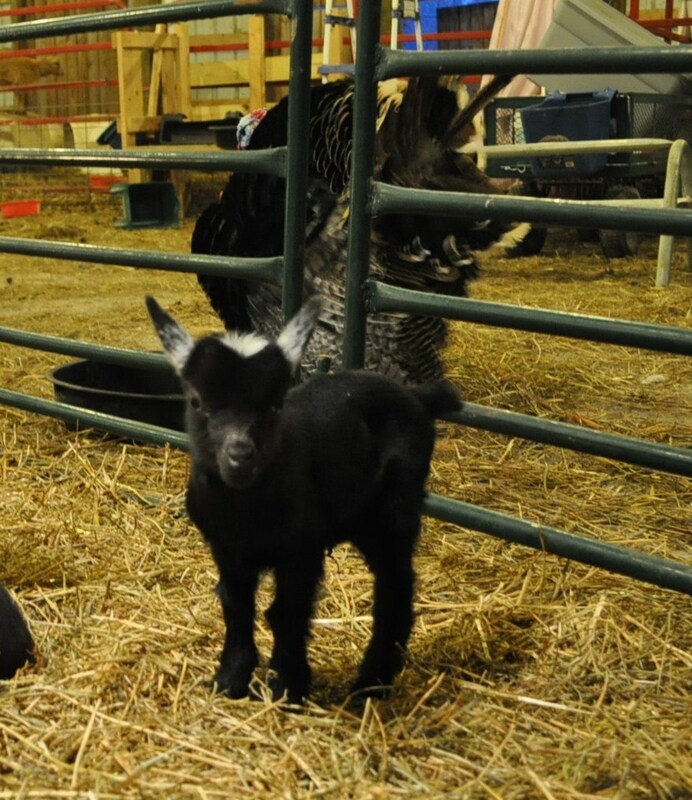 "Fire " was a JR. Grand Champion several years ago, and now resides in Oklahoma at Dill's-a-Little Farm! His pic will be in Cotton's photo album as part of his credentials. 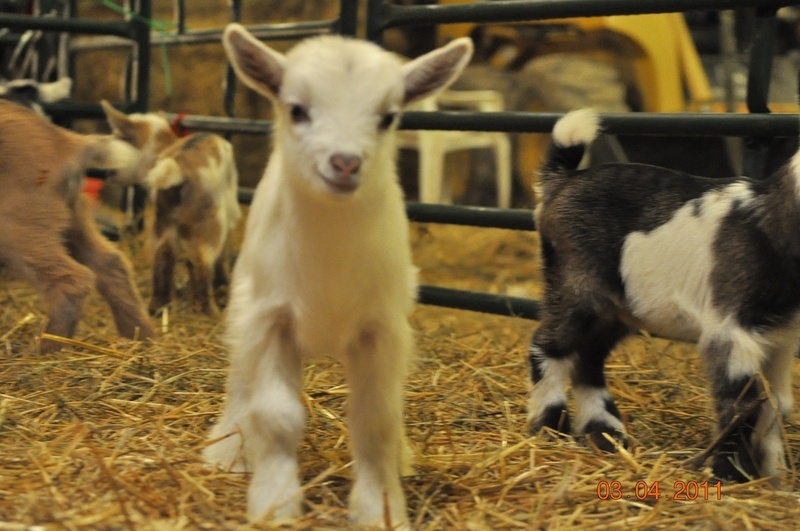 See Cotton's at " PHOTO ALBUMS ALL GOATS" page. On Jack Sparrow's side, there's his dam, ARMCH Twin Creeks MB Stellaluna *D E *AR2097 who had a glorious udder, and Munchranch Cactus Jack! Cotton should make someone a very nice little buck! ~ Johnny, $75 as wether bLuE eYes! SOLD Meredith in KS! ~ Willie, $75 as wether THE LOVER! XoxO SOLD Jeff in MO! JOHNNY: Cute, rowdy little Guy! Willie in center of picture in the baby barrel! Willie is a Lady's MAN! Though he's destined to be a wether, he flirts not only w/ the doelings, but with his human "mama" (me) .....licking my face over and over! Go figure ! He is a sweetheart! 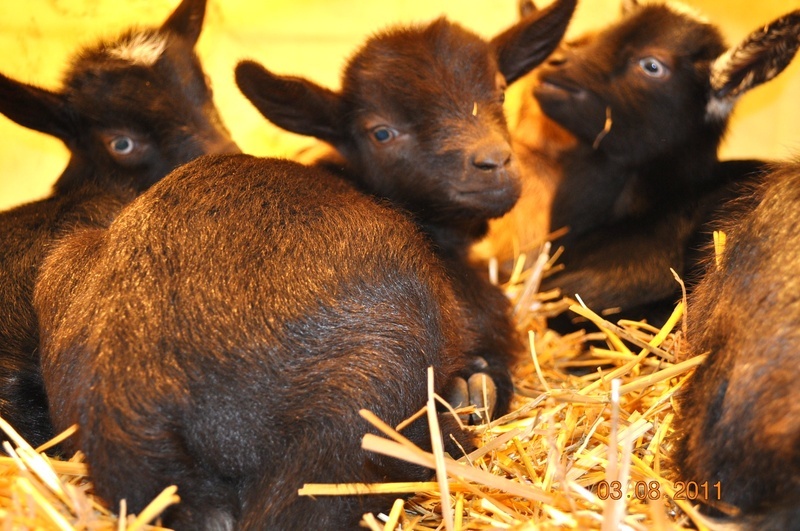 WAYLON (on far LEFT) in playpen: Better pics to come soon! 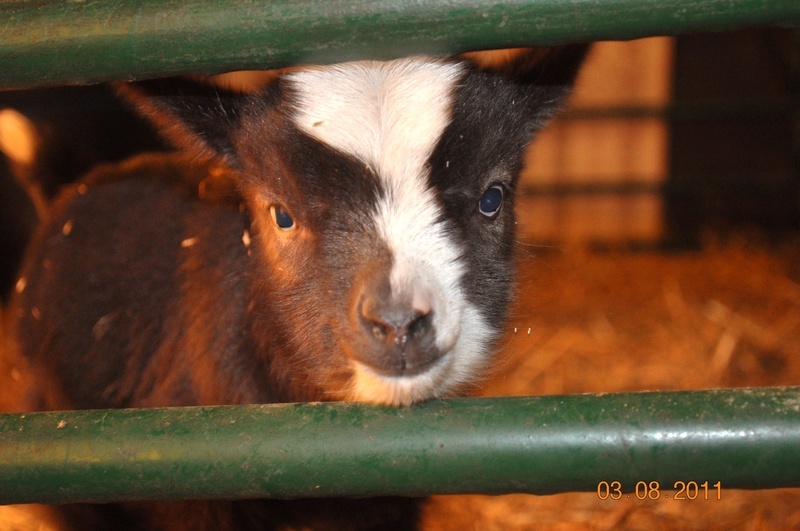 ~ BUCKLING (wether) Buckwheat SOLD Thanks Shirley & Barnett!bLuE eYes! 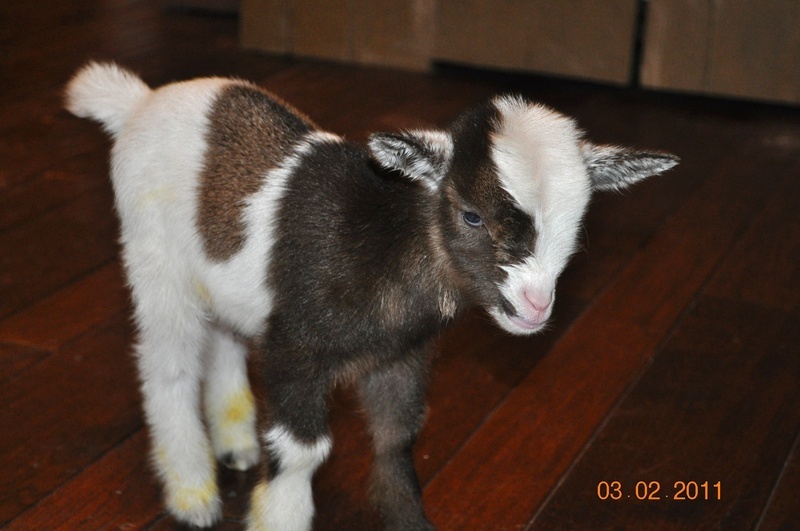 ~DOELING: Wild Daisy, $300 SOLD thanks Terry in MO! BUCKWHEAT so sweet and yellow! WILD DAISY: LOTS of CHROME on this girl! Gorgeous colors + a Dam out of CH/MCH Piddlin Acres Bobby Sox who was also just named ADGA BEST IN SHOW earlier this Season at nearly 10 years old, and with 11 freshenings. Ths one is from some FANTASTIC lineage. ~Buckling: (wether) Flint $75. SOLD Thanks Ralph in KS! 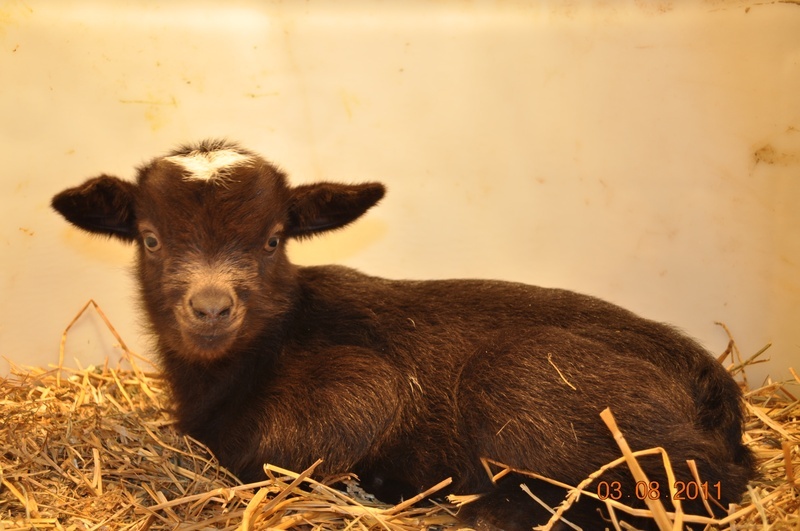 ~Doeling: Gemma$325 SOLD Thanks Meredith& Michaela in KS! bLUE eYes! Gemma at 2 days old looking through the bars at the "big kids!"